Downtown Haddonfield will once again celebrate the latest on-the-go food trend with an even bigger and better food truck event during Haddonfield’s second “Haddonfield Night Market” on Thursday, Nov. 17 from 4 p.m. to 8 p.m., rain or shine. This Night Market event will be expanded with even more food trucks over a much longer stretch of the Downtown. Food trucks will be staged along Kings Highway from Haddonfield Borough Hall to the PATCO Speedline. This is a food lover’s dream, where you can find all types of cuisines from barbecue to Italian, Brazilian to Chinese, and even sweet treats, served from themed food trucks that are scheduled l be parked at various Downtown locations. The “Haddonfield Night Market” is taking place during “Late Night Thursdays” when participating Downtown businesses and restaurants stay open late. Shoppers are encouraged to shop the various businesses located along Kings Highway and the charming side streets, Mechanic Street, Ellis Street, Tanner Street, Haddy Lane, Kings Court, and Haddon Avenue, while nibbling on scrumptious Food Truck treats. Food Trucks include Baby Blue Rolling Kitchen by Carolina Blue Smokehouse and Taproom; Beast of the Street; Cannoli World; Kevin’s Salad Station; Loco Gringo’s Street Taco Express; Mama’s Meatballs; My Four Suns; Oink and Moo BBQ; P.J. Whelihan’s Wing Truck; Pompier’s Pierogi Flats; Rio Brazilian Steak Truck; Say Cheese; Sweet Box; The Cow and the Curd; The Tot Cart; and Undrgrnd Donuts. Various Downtown Haddonfield shops and restaurants will also be participating in the “Night Market” Food Truck event. The Picket Fence and Garden Tea Room will be selling products outside of its shop, located at 103 Kings Highway East. A Taste of Olive will also be offering samples in front of its store, located at 106 Kings Highway East. Live music will be provided by DJ Frank Staff at Haddy as well as Corner Pocket in the Kings Court gazebo from 4 p.m. to 8 p.m. The Haddonfield Farmers Market will also have tents and products set up in Kings Court from 4 p.m. to 8 p.m.
During the Food Truck event, shoppers and foodies are encouraged to take and share photos of food truck creations as they browse from truck to truck. Be sure to use the hashtag #HaddonfieldEats when posting to social media. 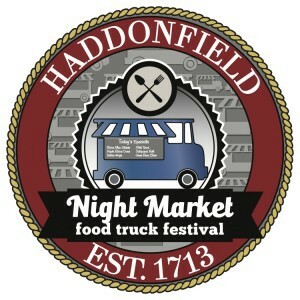 For more information about the “Haddonfield Night Market” Food Truck event or downtown Haddonfield, please call the Haddonfield Information Center at (856) 216–7253 or visit www.DowntownHaddonfield.com.